I love a good book. I love a good book that has great characters. 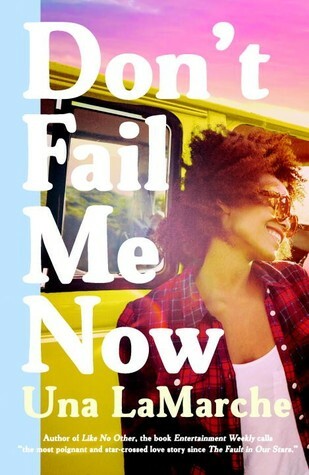 I love a good book that has great characters and a touching story...Don't Fail Me Now gave me all of my loves! I'll start off by saying that Don't Fail Me Now turned out nothing how I expected it would. It went down a road(no pun intended) that I was not expecting, but that is what I ended up loving about it! For some reason, I had thought this book was going to be a light and funny read but it didn't turn out that way at all. Yes, it has it's funny parts and great one-liners but the book dives much deeper. It tackles some pretty difficult issues ranging from drugs, homelessness and broken homes. It gets pretty heavy at times and will have your heart aching for Michelle, Cass and Denny. It will also have your heart aching for the people in the world that really deal with this in real life. I completely devoured Don't Fail me Now. It moved at a wonderful pace and each character had their own voice, even Denny. Not one character over-crowded the other. I have to admit that the book started a off a bit slow for me, but redeemed itself very quickly. About 50 pages in, I was officially hooked! Heart-wrenching at times, delicate and romantic in others Don't Fail Me Now turned out to be a very pleasant surprise! The author delivered each issue with poise. I think anyone dealing with any of what Una LaMarch touches on in this book would find comfort in relating to the characters. Each character had a beautiful grace about them and proved they were not their problems. Don't Fail Me Now is the perfect book to wrap up your Summer Reading and end it with a bang!